Too funny…. while browsing around my blog, I noticed that I had another post called “I bought a book the other day”. Dunno… just me I guess. So the other day I bought a book. 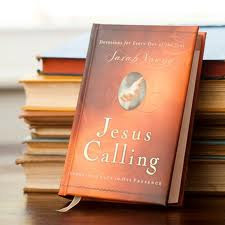 It’s a devotional called “Jesus Calling” by Sarah Young. I had heard/read about this little devotional in another book I’m reading, so when I spotted it in the store, of course I bought it. I had no idea how much this little book would bless my days. I bought the book on July 29. The devotion for that day… “Your mind will wander from me, but the question is how far you will let it wander”. I was totally taken back by those words. Over the last few weeks, I’ve been very scattered. I’m doing all that I should be doing, just not in any organized way. Sort of just bobbing around here and there. I won’t say that the words in that devotion made me “snap-to” and all is right and organized in my life. But it sure did give me pause for thought. A reminder that He is the anchor of my soul and it really is up to me how far I am willing to wander. He is there, that anchor that holds me from just drifting off. I have been blessed over the last few days. As I turn the page of that little devotional each morning, it just speaks to my soul. It speaks to the longing that I have for my life to be back to where it was 7 years ago. I know that must sound odd to folks. 7 years ago is when I lost my husband. It was the time when everything I knew went totally upside down. BUT…. it was also the only time that I can remember that I was totally dependent on the Lord. My walk with Him during that time was sweet and precious. I used to wake up totally aware of Him and I waited on Him, expecting Him to show up every morning. AND HE DID! Oh the blessings of those days. And now my life is different. I’m not saying it’s bad. Oh gosh no. I have a wonderful new life with a wonderful man. I’m blessed as a woman to have found a man like Michael. It’s the days that just keep going by. I’ve not woken up with that expectancy in a very long time. I know that God didn’t desert me. I know that for a fact. I know that it’s me that has not paid as much attention as I should to the tugging on my heart. I think it’s time to see if I can find that little boat and tighten up that anchor line.